For the twenty-fifth season, the Christmas Revels brought to Sanders Theatre the ancient and joyous celebration of the year's rebirth that surrounds the winter solstice, the shortest day. In the quarter century since John Langstaff urged the first Cambridge audience to "Sing!" eight other communities in the United States have joined the chorus, and, at this special time of year, are celebrating along with us. 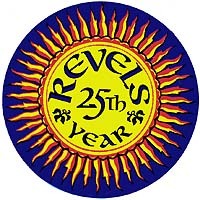 Revels audiences have journeyed in imagination with us to the frozen steppes of Russia, to Renaissance France, to Norwegian fjords and Mexican fiestas, singing in unfamiliar tongues, and rising to join hand in hand in the dance which for many is the core of the Revels celebration. To celebrate is to pay attention to something special, and to mark this 25th year we have come home. Imagine (as did the first Revels audience) that we are in England, in the Banqueting Hall of a mediæval castle, awaiting the arrival of a great King and the commencement of the annual festivities. Our companion-in-waiting is the Fool (who has the least comfortable seat in the house, and is ready to represent the grievances of those of you in partial-view seats). The King and the Fool appear in literature and folk tale, like planets forever orbiting each other, performing an intricate and mysterious dance. It is a difficult relationship--the Fool always vulnerable to the whim and displeasure of a powerful ruler, the King aware that the Fool stands upon the threshold of his kingly power holding the only mirror in the kingdom which can reflect a true likeness. We are entering into the time of the Feast of Fools, when nothing is sacred, and every convention will be tested. For now is the time of Chris-ti-mas.